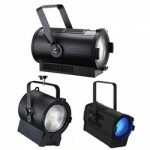 A theatrical fresnel is a soft edged circle of light that can zoom in size from spot to flood by changing the relationship of the lamp with the interior reflector. They are simplistic fixtures that have stood the test of time in their ability to provide basic controllable light. They range in size from a 3" diameter lens to an 8" diameter lens. 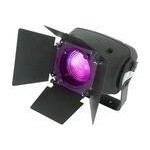 They range from 100 watts to 1000 watts. In the film industry they can become much larger. Read on to learn more about fresnels. There are traditional lamp and LED varieties. 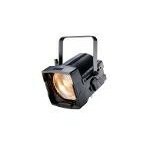 The traditional lamp theatrical fresnels range from 100 to 1000 watts. 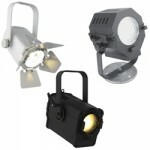 The LED varieties range in single color white with different kelvin temperatures to a few with color changing ability. The traditional lamp and single color LED units can be colored with gel in a gel frame in the front accessory slot. Fresnels are generally named by the diameter of their lens. A 3" fresnel has a 3" diameter fresnel lens. The smaller the lens the smaller the output and effective throw distance. Almost all fresnel units have the ability to hold a barndoor which allows to adjust the edge of the beams location. 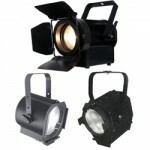 It is not a hard cut like a shutter in an ellipsoidal but more of a gentle beginning and end to the soft beam of light. Fresnels have the adjustability of going from a spot focus to a flood focus by changing the relationship of the lamp to the reflector. Each fresnel uses a slightly different way of accomplishing this but none of them are hard to do.